The range of assistive technology for visually impaired learners has grown over the last few years, with interactive experiences becoming more sophisticated and applications becoming less clunky. Different media (visual, auditory and tactile) have been developed to help students to study independently, and to empower them to create their own resources and artefacts. This resource aims to collate a few of those resources in one place for you to explore to see if they would suit your learners and their needs. A good place to start is with this paper "ICT educational tools and visually impaired students: different ans...", which discusses some of the obstacles faced by visually impaired learners, as well as providing an overview of some examples of Web based tools available to help meet the needs of visually impaired students. A complementary resource, this Unit offers a series of scenarios that give ideas about how to incorporate ICT into teaching and provide access for those students with visual disabilities. In addition, this document "ICT Tools for Visually Impaired Persons – Examples" provides in-depth descriptions of the types of assistive technology available. It also has links to some presentations and further information around building the capacity of visually impaired individuals to use technology tools. If you are interested finding out more about the use of assistive technology for students with disabilities and some reflections on the nature of knowledge that is being produced by researchers who are examining these issues, you are likely to find this 2008 meta-study useful (but note you do have to be a member of TAM to read the full text):Research About Assistive Technology: What Have We Learned? Please let me know if you have any to add, or if you have opinions and comments about any of the resources. Although it's a specific piece of technology, there is quite a lot of enthusiasm in the partially sighted and blind community around the iPad. Apple has made it such that a blind user could start with an iPad out of the box, with the Voiceover integrated into the device so that when a user runs their finger over the screen, any text is 'read out'. This same application can be used to read eBooks aloud. To find out more from two blind users of iPads, their reviews are excellent. 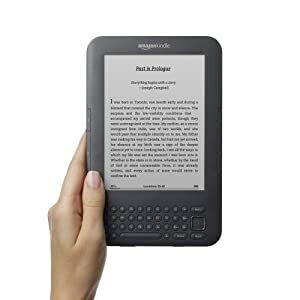 Most people are now familiar with digital book or e-readers. There are a range to choose from, and most have an option for text to be 'read' aloud by the device. 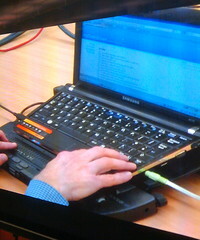 An application installed onto a computer and that will identify, interpret and 'read' aloud any text on the screen. Although some screen readers have a rather robotic sounding narrator, many have reasonably well-modulated speech, with pauses in most of the right places. These are, as the title suggests gizmos that provide speech output without a visual display. You are able to connect them to devices such as computers, scanners and printers to upload text. Braille keyboards are also available for Braille users.